Chernihiv region (Чернігівщина; Chernihivshchyna). A historical-geographic region in northeastern Ukraine on the border with Russia and Belarus. In the west the Chernihiv region borders on the Kyiv region; in the east, on Slobidska Ukraine; in the northwest, on Belarus; and in the north, on Russia (Briansk region). 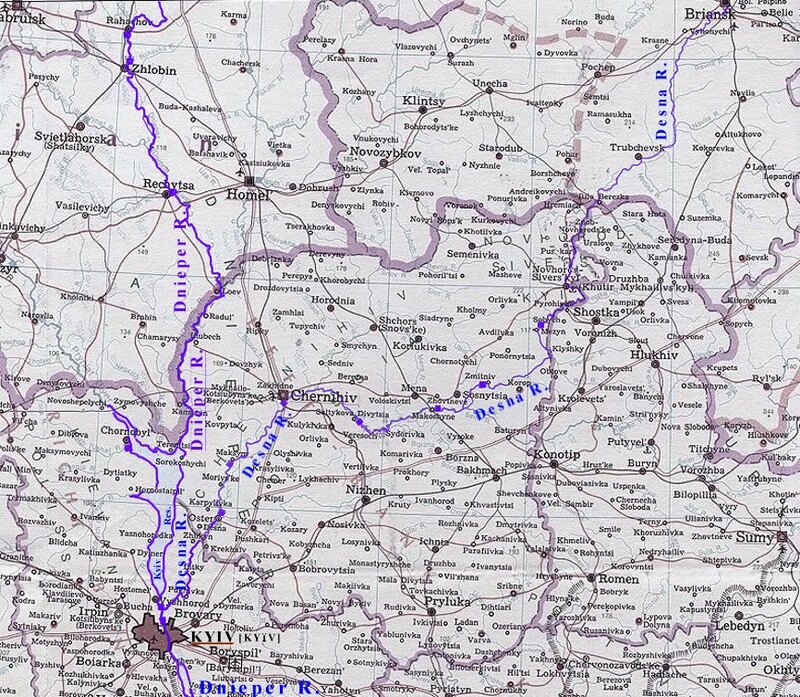 The precise boundaries of the Chernihiv region have changed over the centuries. The territory has an area of about 55,700 sq km. During the Princely era the Chernihiv region formed the nucleus of Chernihiv principality, which also encompassed large territories in the north (Briansk region), the northeast (Kursk region, Murom-Riazan land), and the southeast (Tmutorokan principality). 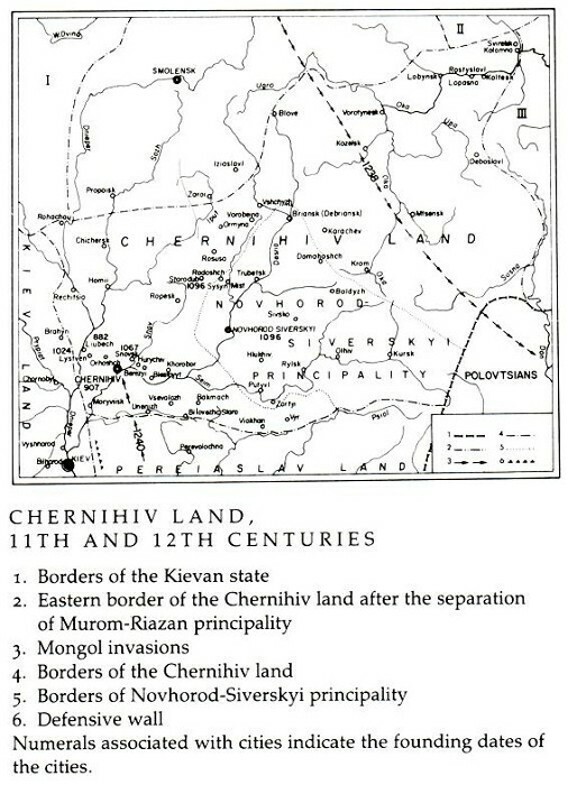 In 1239 the Chernihiv region was captured by the Tatars, in 1356 most of the region was annexed by the Grand Duchy of Lithuania, and in 1503 it came under the control of Muscovy. The Truce of Deulino (11 December 1618) transferred the region to Poland, and it became Chernihiv voivodeship. 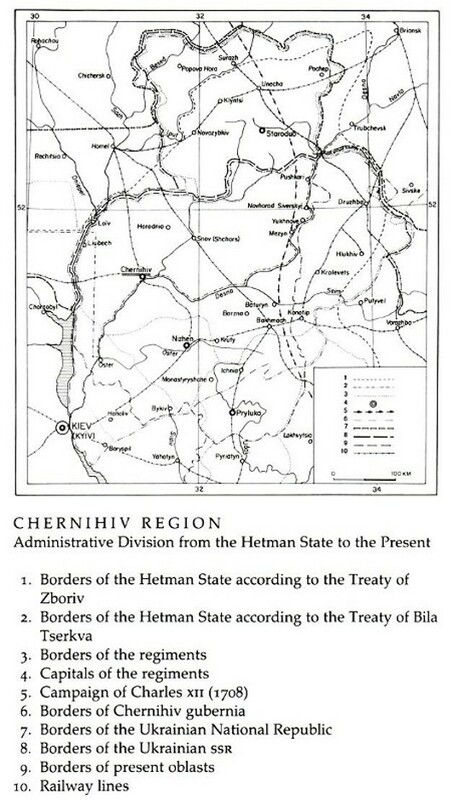 In 1648 the Chernihiv region became part of the Hetman state and encompassed the Chernihiv regiment, Starodub regiment, and Nizhyn regiment as well as parts of the Pereiaslav regiment and Pryluky regiment. After the abolition of Ukraine's autonomy the Chernihiv region was divided into two vicegerencies in 1782—the Chernihiv vicegerency and Novhorod-Siverskyi vicegerency—which survived until 1797 and then became part of the Little Russia gubernia (covering the territory of the Hetman state). In 1802 the gubernia was reorganized into two gubernias—Chernihiv gubernia and Poltava gubernia—which endured until 1917. In 1917–19 the Chernihiv region, including its northern part (the counties of Starodub, Mglin, Surazh, and Novozybkov), belonged to the Ukrainian National Republic (UNR). In 1919 the Chernihiv region was captured by the Soviet forces, and the four northern counties were transferred to Homel gubernia and then in 1926 to Briansk gubernia of the Russian SFSR. In 1925 Chernihiv gubernia was divided into okruhas, and in 1932 it was reorganized into Chernihiv oblast. In 1939 the eastern part of the oblast was transferred to the new Sumy oblast, and a small southwestern part was transferred to left-bank Kyiv oblast, while Chernihiv oblast acquired the Pryluky area. In general the Chernihiv region is not rich in natural resources and has a moderate population density. Farming in this region has been less profitable than in other regions of Ukraine. Hence there have been frequent migrations from the Chernihiv region to other territories, such as southern Ukraine and the Far East. 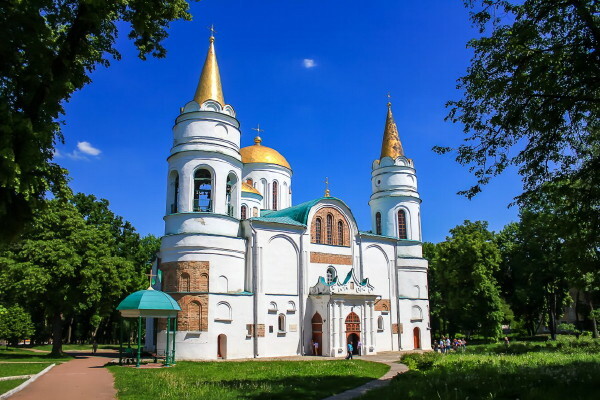 From the historical, cultural, and ethno-linguistic viewpoint the Chernihiv region has always been an integral part of Ukraine and has often rivaled the Kyiv region as the center of Ukrainian territory and the Ukrainian people. Geography. 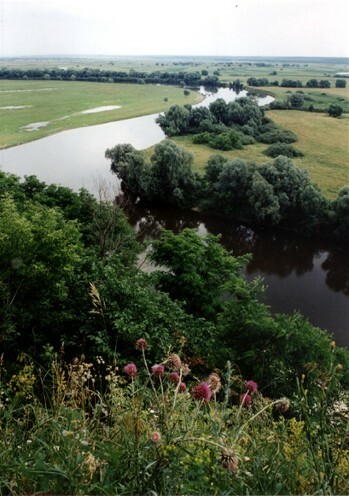 The Chernihiv region encompasses the northern part of the Dnieper Lowland, which is a somewhat swampy plain sloping from the northeast (elevation, 200–220 m) towards the southwest (elevation, 120–150 m). The climate is moderate-continental: the temperature in July is usually 18.4º to 19.7ºC and in January –6.7º to –7.6ºC. The annual precipitation is 500-600 mm. The growing season is 190–200 days. 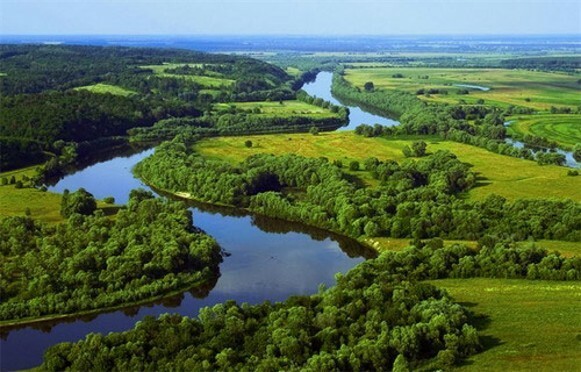 The Chernihiv region lies in the Desna Basin, which includes the left-bank tributaries of the Desna River—the Oster River, Doch River, and Seim River—and the right-bank tributaries—the Bilous River, Snov River, Mena River, Ubid Rivir, and Sudost River. 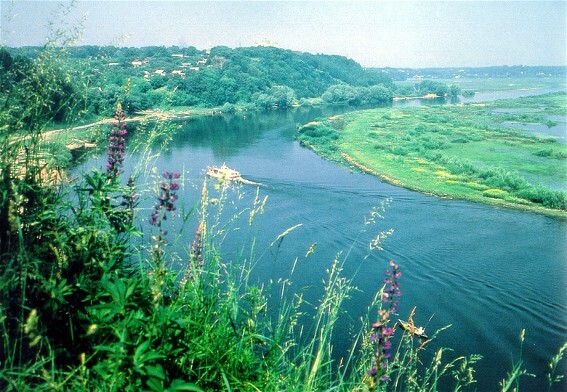 The Dnieper River and Sozh River mark the western boundary of the Chernihiv region. 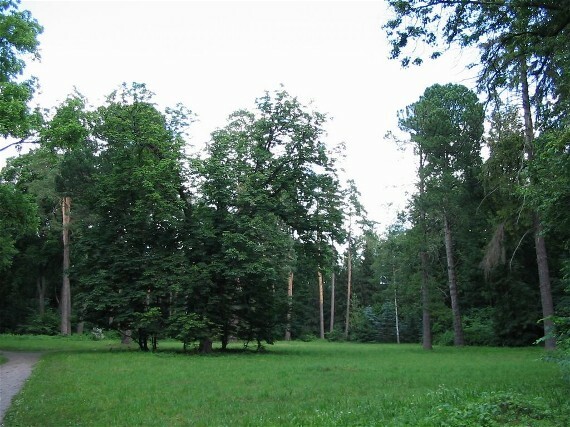 The forests in the northern part of the region consist mostly of pine, oak, birch, hornbeam, and alder; in the southern, forest-steppe part small oak forests are predominant. Forests occupy one-fifth of the region's land area. The soils in the northern, Polisian part are sandy podzolic, and in the southern part, chernozems. Population. 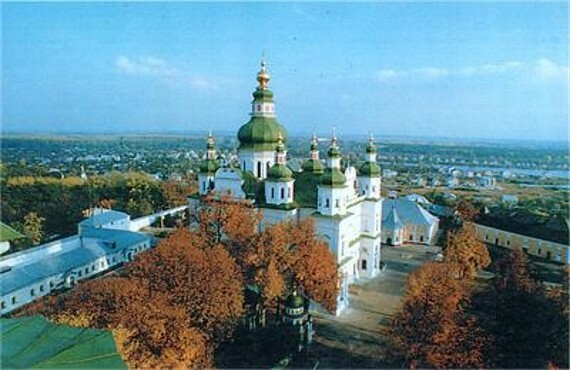 The Chernihiv region has been inhabited from the earliest times. In the 8th century AD the Siverianians appeared in the region. 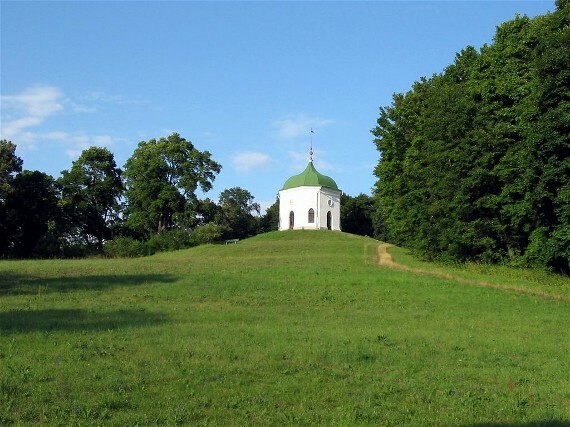 Besides the native Ukrainian population, there were some Russians, mainly Russian Old Believers fleeing religious persecution, who established homesteads and settlements in the Chernihiv region in the 17th–18th century, mostly in Starodub, Novozybkov, Surazh, and Horodnia counties. Klyntsi (Klintsy) became their cultural center. From the end of the 18th century there was also an exodus. It consisted of peasants, who fled from the Chernihiv region to the south (to the Katerynoslav region, Tavriia, the Kuban, and Caucasia) and to the east. In the brief period 1782–91, about 700,000 peasants emigrated from the Chernihiv vicegerency and Novhorod-Siverskyi vicegerency. Emigration continued at the end of the 19th and the beginning of the 20th century. Between 1893 and 1903, 11,300 peasants per year on the average left Chernihiv gubernia to resettle in remote regions of the Russian Empire, such as the Central Asian steppe, the Urals, Siberia, or the Far East. In 1906–12, 157,600 peasants emigrated to Siberia. Large numbers of peasants from the region—about 133,000 per year in 1893–7—took up seasonal work in other parts of Ukraine such as Katerynoslav gubernia, Kherson gubernia, and Tavriia gubernia, the Donets Basin, and the Kryvyi Rih region (see Kryvyi Rih Iron-ore Basin). Thirty-five percent of the miners in Kryvyi Rih came from the Chernihiv region. In spite of emigration and migration, the population of the Chernihiv region (and later Chernihiv gubernia, which included most of the region) increased steadily from 964,500 in 1764 to 1,176,570 in 1782, to 1,374,746 in 1851, to 1,471,866 in 1858, to 2,321,900 in 1897, to 3,132,000 in 1914 (according to Stepan Rudnytsky). Natural population growth in 1897 was 17.8 percent. Yet the population density in Chernihiv gubernia (area, 52,400 sq km) was one of the lowest for the Ukrainian gubernias: 26.2 inhabitants per sq km in 1851, 44.3 in 1897, and 59.8 in 1914. Most of the population (91.1 percent) was peasant; only 207,390 people lived in cities (in 1897). There were 19 cities in the gubernia, the largest being Chernihiv (27,000), Nizhyn (32,000), Starodub (26,000), Konotop (23,800), Hlukhiv (17,600), Nosivka (15,500), Borzna (15,000), Novozybkov (15,000), Berezna (13,100), Krolevets (12,800), Klintsy (12,000), and Ichnia (10,000). At the end of the 19th century Chernihiv gubernia was divided into 15 counties. In 1860 the gubernia's population consisted of the following social strata: enserfed peasants (38.8 percent), state peasants (44.5 percent including Cossacks, who accounted for 30.8 percent), burghers (9.4 percent), nobles (1.6 percent), clergy (0.9 percent), merchants (0.6 percent), and military and others (4.5 percent). Eighty-four percent of the population in 1897 were peasants, and 16 percent were of other social classes. In 1913, 308,720 of the 2,956,000 inhabitants were urban residents; of these, 79,700 were tradesmen and 18,100 were factory workers. By national composition the population of the Chernihiv gubernia in 1897 was as follows: Ukrainians, 85 percent; Belarusians (who settled in Surazh county in the 17th century), 6 percent; Russians, 5 percent; and other nationalities, such as the Jews, Poles, and Germans (who had four colonies in Borzna county and two in Konotop county), 4 percent. Stepan Rudnytsky gave similar statistics for 1914: Ukrainians, 85.6 percent; Russians, 9.0 percent; Jews, 4.9 percent; Germans, 0.4 percent; and Poles, 0.1 percent. In terms of religious affiliation, 91.8 percent of the gubernia's population in 1897 was Orthodox; 0.9 percent, Edinovertsy; 0.9 percent, Old Believers; 0.2 percent, Protestants; 0.3 percent, Catholics; 5.0 percent, Jews; and 1 percent, other. During the Soviet period changes occurred in the region's administrative division and in the national composition of its population. According to the 1926 census, the territory of former Chernihiv gubernia was inhabited by 2,906,000 people, of whom 73 percent were Ukrainians; 23.1 percent, Russians; 2.6 percent, Jews; and 1.2 percent, Belarusians. The population of the part of the Chernihiv region that belonged to the Ukrainian SSR (excluding the four counties of Klyntsi, Novozybkov, Starodub, and Pochep, where the population was 14.7 percent Ukrainian and 79.3 percent Russian) was 92.7 percent Ukrainian, 4.9 percent Russian, and 2.2 percent Jewish. The later official censuses recorded population statistics by oblast, and the boundaries of Chernihiv oblast did not coincide with the boundaries of Chernihiv gubernia or with those of the Chernihiv region. The total population of Chernihiv oblast has been steadily decreasing over the last 40 years: in 1940 it was 1,787,000; in 1959, 1,573,000; in 1970, 1,560,000; in 1981, 1,483,000; and in 2001, 1,245,300. This decline has coincided with urban growth and a population transfer from country to city: the rural population fell from 1,504,000 in 1940 to 796,000 in 1981 and to 518,900 in 2001, while the urban population rose from 282,000 (1940) to 686,000 (1981) and to 727,200 (2001). Population density in the oblast is one of the lowest in Ukraine: 39 inhabitants per sq km. 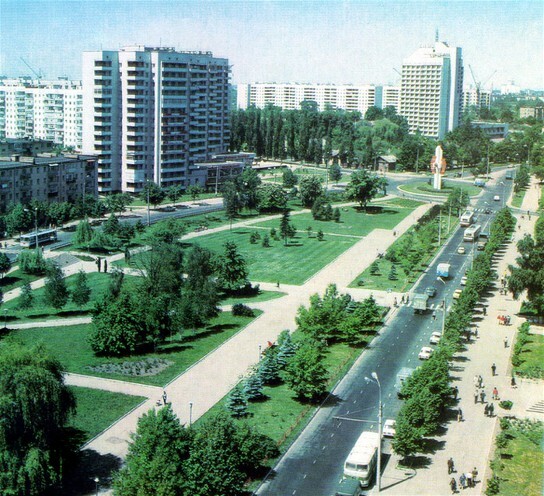 Since the 1960s Chernihiv oblast has had the lowest natural population growth of all Ukrainian oblasts: 0.9 per cent in 1976. According to the 1959 census the national composition of the population was: Ukrainians, 94.5 percent; Russians, 3.9 percent; and Jews, 0.8 percent. In 1970 the respective figures were 93.8, 4.7, and 0.7 percent, and in 2001 they were 93.5, 5.0, and 0.1 percent. These data indicate that the national profile of the Chernihiv region, where Ukrainians account for a higher proportion of the population than in any other region of Ukraine, remains stable. History. 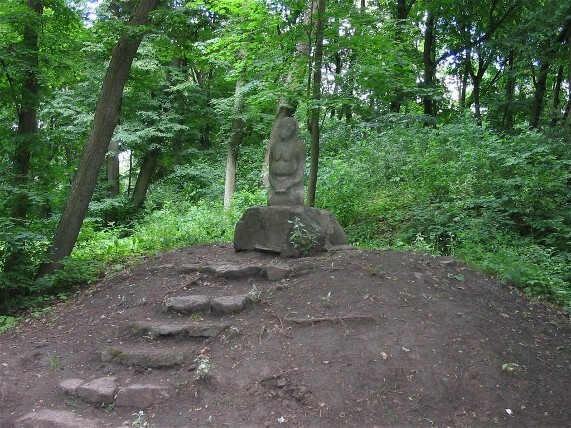 The Chernihiv region has been inhabited since the middle Paleolithic Period (Chulativ village near Novhorod-Siverskyi). The number of settlements increased in the Upper Paleolithic Period (40,000–8,000 years ago), when temporary settlements were built on the Desna River (the sites Pushkari and Mizyn north and south of Novhorod-Siverskyi), at Novhorod-Siverskyi (see Novhorod-Siverskyi archeological site), and at Zhuravka on the Udai River. Relicts from the Neolithic Period have been found in the vicinity of Kudlaivka and Sosnytsia on the Desna. The settlements at Yevmynka (see Yevmynka settlement) and Morivske in Kozelets raion belong to the Trypilian culture. 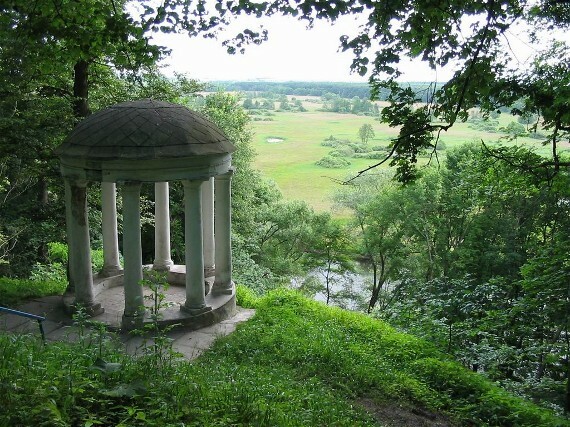 The remains of Scythian fortified settlements of the 5th century BC, which are known as the Yukhnove settlements (see Yukhnove culture), are found along the Desna near Novhorod-Siverskyi (see Novhorod-Siverskyi archeological site). In the mid-14th century Algirdas, the grand duke of Lithuania, defeated the Tatars and gained control of the Chernihiv region. At first Lithuania respected the autonomy of the appanage principalities, leaving them in the hands of local princes. At the beginning of the 15th century, however, the small principalities were abolished, and administrators were appointed. In this period the Chernihiv region was plundered frequently by the Tatars. In the war of 1500–3 Lithuania lost the region to Muscovy. Poland obtained the territory by the Truce of Deulino in 1618 and in 1635 formed Chernihiv voivodeship out of its northern part (Chernihiv, Novhorod-Siverskyi, Konotop, Putyvl, and Hlynsk), while attaching the southern part (Nizhyn, Oster, and Baturyn) to Kyiv voivodeship. The Polish administration exploited the local population, and the Polish nobility seized lands belonging to Ukrainian peasants or burghers. Hence the population of the region took part in the Cossack uprisings of Pavlo Pavliuk (1637) and Yakiv Ostrianyn (1638) against the Poles. The region's proximity to Russia was convenient for trade; hence trade centers developed in the Chernihiv region. 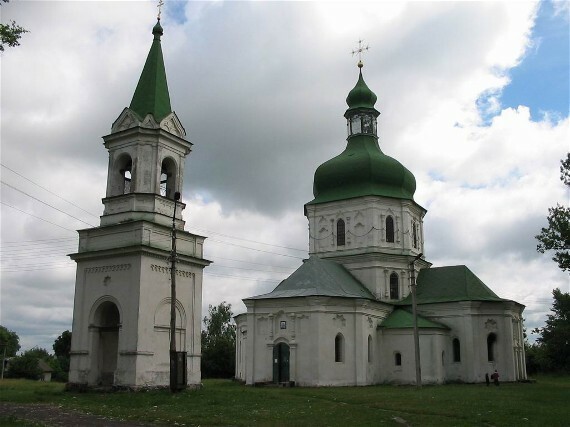 According to the census of 1666, among the important cities in the region were Nizhyn, with 642 taxpaying households; Konotop, with 474; and Baturyn, with 365. 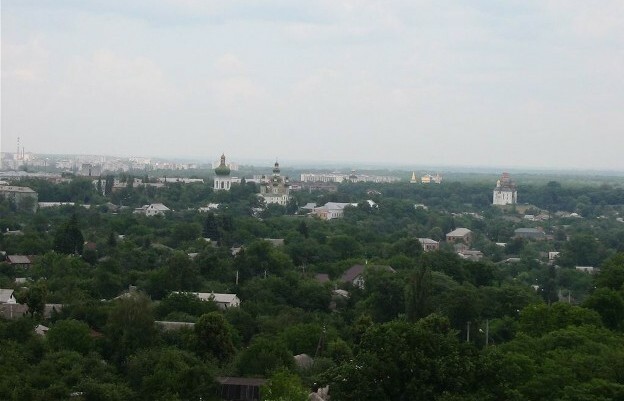 Chernihiv and Nizhyn obtained the privileges of Magdeburg law. In the 18th century the number of manufacturing enterprises in the Chernihiv region increased: in 1728 sailcloth began to be manufactured in Pochep, and in 1737 woolen cloth began to be produced in Riashky village near Pryluky (700 workers) and in Sheptaky village near Novhorod-Siverskyi. Flour milling developed rapidly: in the 18th century there were 2,759 windmills and 1,511 watermills in the Chernihiv region. Nizhyn became the largest economic center of the region. Beginning in 1657, large fairs that attracted merchants from various cities in Ukraine and abroad were held in Nizhyn. By the end of the 18th century the urban population had increased significantly: in 1786 Nizhyn had a population of 11,000; Pryluky, 6,200; and Chernihiv, 3,900. In the 17th–18th century the region played a leading cultural role in Left-Bank Ukraine, and indeed the whole of Ukraine. Such cultural and religious leaders as Lazar Baranovych, Ioanikii Galiatovsky, and Ioan Maksymovych lived and worked there. In 1700 Maksymovych founded Chernihiv College on the model of the Kyivan Mohyla Academy. The famous physician Danylo Samoilovych studied at this college in 1755–61. The general flag-bearer Mykola Khanenko pursued his political career in the Chernihiv region. 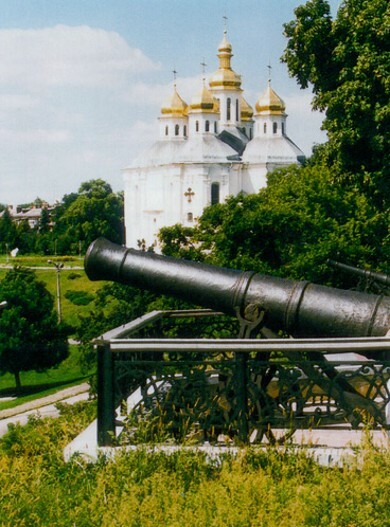 In the mid-18th century parochial elementary schools were opened in the cities and villages: there were 215 of them in Nizhyn regiment and 144 in Chernihiv regiment. Printing was an important factor in the growth of culture and education: in 1675 a printing press was established in Novhorod-Siverskyi and was later transferred to Chernihiv (see Chernihiv printing press). 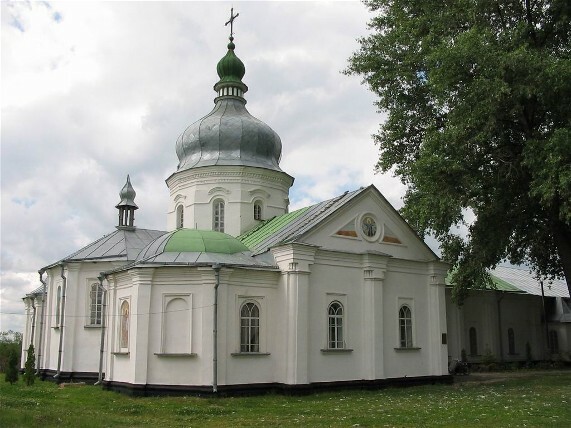 The 16 monasteries and 4 convents in the Chernihiv region played an important cultural as well as religious role in the 18th century. 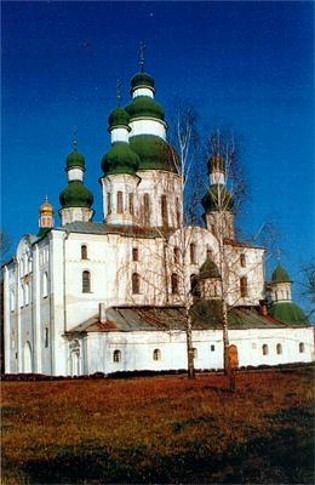 The most prominent ones were the Trinity–Saint Elijah's Monastery and the Yeletskyi Dormition Monastery in Chernihiv, the Monastery of the Transfiguration in Novhorod-Siverskyi, the Monastery of the Annunciation in Nizhyn, the Hustynia Trinity Monastery near Pryluky, and the monasteries in Liubech, Rykhly (see Rykhly Saint Nicholas's Monastery), Domnytsia, and Makoshyne. 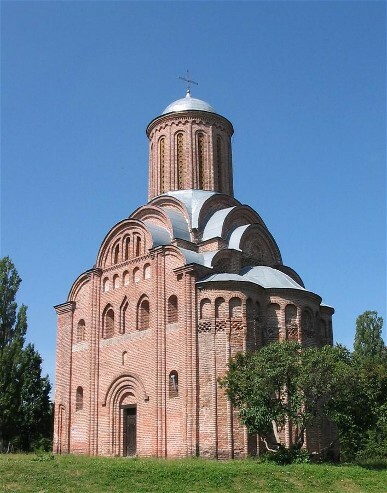 During the Hetman period and at the end of the 18th century architecture in the Chernihiv region attained a high degree of development. Monuments of the Princely era were restored, and new architectural ensembles were erected. 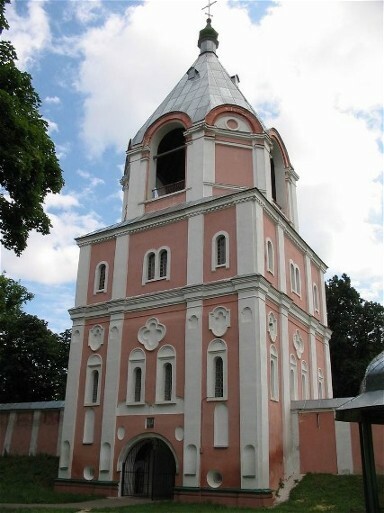 In Chernihiv the Yeletskyi Dormition Monastery was restored and the Church of Saints Peter and Paul was added to it, and the Trinity–Saint Elijah's Monastery acquired the Cathedral of the Trinity (1679–95), the Church of the Presentation at the Temple, and the bell tower. 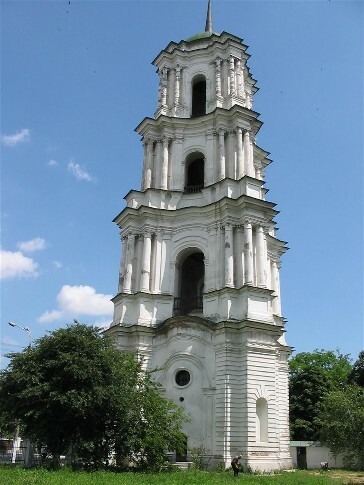 The most prominent secular buildings that appeared in Chernihiv were the regimental chancellery and the Chernihiv college (1700–2). 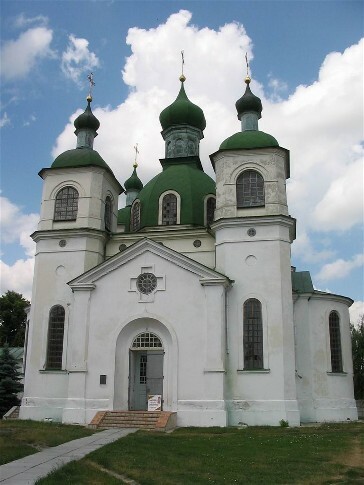 In Nizhyn the following churches were built: Saint Nicholas's Cathedral (1668), Saint Michael's Church (1714–31), the Cathedral of the Annunciation (1716), the Church of the Holy Protectress (1757), and the Cathedral of the Presentation at the Temple (1772). 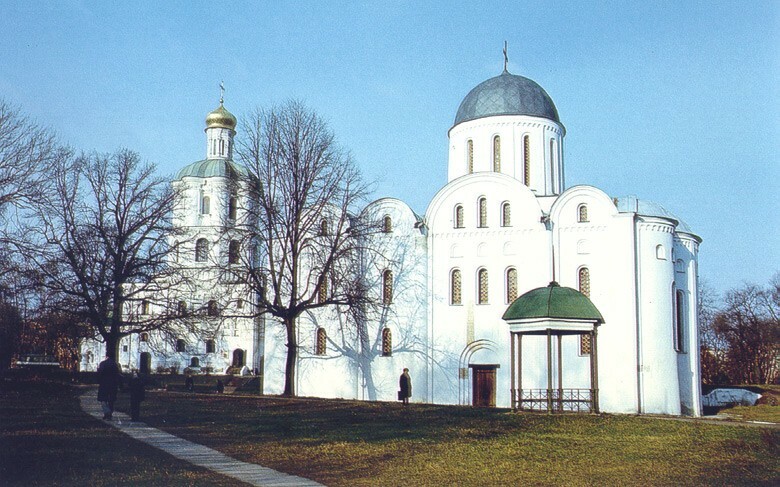 New churches and secular buildings, such as the Dormition Cathedral (1796), the Church of Saints Peter and Paul, the student residence, and the triumphal arch, were built, and the Cathedral of the Transfiguration (1796) was rebuilt in Novhorod-Siverskyi. The complex of the Hustynia Trinity Monastery, particularly its Trinity Cathedral (1674), was an important architectural achievement. The two-story building of the regimental chancellery (1760) and the Cathedral of the Nativity of the Mother of God (1752–63), which were built by Andrei Kvasov and Ivan Hryhorovych-Barsky, as well as the many-storied bel tower, have been preserved in Kozelets. 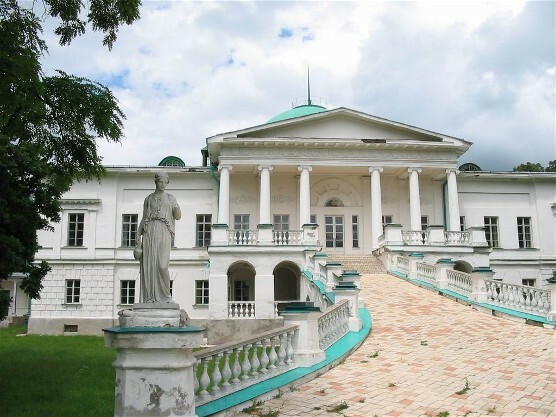 The palace of Kyrylo Rozumovsky was built in Baturyn by A. Rinaldi and C. Cameron. After the abolition of the Hetman state and the destruction of the Zaporozhian Sich, until the beginning of the 19th century the traditions of Cossack statehood and aspirations to autonomy were strongest in the Chernihiv region. The Ukrainian Cossack officers (see Cossack starshyna) and the region's prominent families did not collaborate with the Russian authorities and did not assimilate into the Russian culture. On the contrary, they propagated Ivan Mazepa's and Pavlo Polubotok's ideal of independence, informed foreigners about Ukraine's past, and published materials on history, literature, ethnography, and the Ukrainian church. The Ukrainian patriots who served as gubernial marshals of Chernihiv vicegerency—I. Horlenko (1782–5), Andrii Poletyka (1785–8), and V. Tarnovsky (1790–4)—encouraged this kind of work. 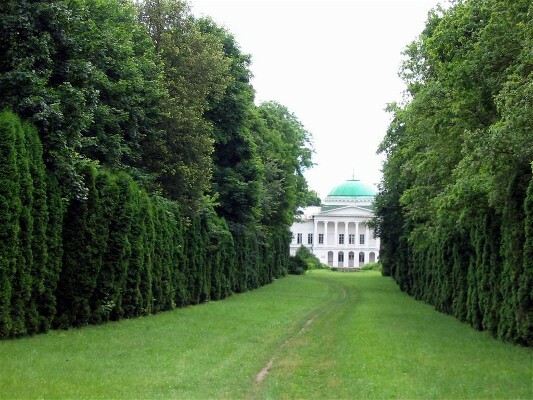 A separate Cossack estate with its own rights and privileges survived in the Chernihiv region until 1917. The most active groups in the national movement were the Novhorod-Siverskyi patriotic circle and the Chernihiv circle, which consisted of prominent cultural and political figures tied to the Chernihiv region by birth or career. Many Ukrainian autonomists were active at the end of the 18th century in the Chernihiv region: H. Dolynsky, Pavlo Koropchevsky, Andrii Hudovych, Ivan Khalansky, Fedir Tumansky, Andrii Rachynsky, Mykhailo P. Myklashevsky, Opanas Lobysevych, Arkhyp Khudorba, Petro Symonovsky, Bishop Varlaam Shyshatsky, Archimandrite Melkhysedek Znachko-Yavorsky, Rev A. Pryhara, Opanas Shafonsky, and others. During Napoleon Bonaparte's invasion of Russia in 1812 the Ukrainian upper class did not side with him because of his pro-Polish orientation. Six Cossack cavalry regiments and eight infantry regiments of 25,000 soldiers were mobilized in Chernihiv gubernia and were supported by the local population. In the 1820s some professors of the Nizhyn Lyceum maintained ties with the Little Russian Secret Society. Some Ukrainians from the Chernihiv region were also involved in the Decembrist movement. In the first half of the 19th century there was an upsurge in education and cultural life in the region. At the beginning of the 19th century there were gymnasiums in Chernihiv and Novhorod-Siverskyi (est 1808). The latter was attended by such outstanding cultural figures as Mykhailo Maksymovych, Konstantin Ushinsky, Panteleimon Kulish, and Mykola Kybalchych. 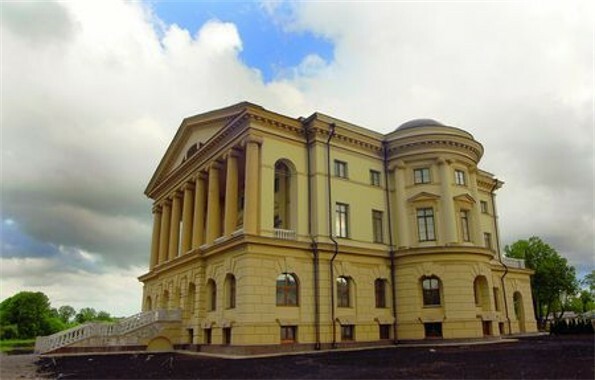 In 1820 a gymnasium was also opened in Nizhyn, which in 1832 became a lyceum and in 1875 the Historical-Philological Institute. Among its prominent graduates were such figures as Nikolai Gogol, Yevhen Hrebinka, Vasyl Tarnovsky, and Oleksander Lazarevsky. Important contributions to Ukrainian culture and scholarship were made by individuals born in the Chernihiv region: for example, the composer Maksym Berezovsky, the sculptor Ivan P. Martos, and the Slavist Osyp Bodiansky. In the first half of the 19th century the economy of the Chernihiv region underwent some changes. The land area devoted to industrial crops, particularly tobacco, hemp, and sugar beets, was increased. Up to 800,000 poods of tobacco and 10 million poods of sugar beets were harvested annually during the 1840s. In 1847 there were 25 sugar refineries in Chernihiv gubernia, and in 1866 there were as many as 66 refineries, producing 316,000 poods of sugar annually. The sugar industry employed 11,000 workers. A liquor industry also developed: in 1860 there were 336 distilling factories in the gubernia, including 91 whiskey distilleries and 52 breweries. Another important branch of industry in the Chernihiv region was woolen-cloth manufacturing. The first woolens factory was built in 1810 in Masheve near Novhorod-Siverskyi. By 1851 there were 13 such factories. In 1860 these factories employed 4,233 workers and produced over one million arshins of woolen cloth. Klyntsi was the industry's center, and it is still noted for its woolen cloth. In 1860 there were 62 leather-manufacturing enterprises in the region, of which the main ones were located in Sedniv, Semenivka (Chernihiv region), Dobrianka, and Starodub. There were also four glassworks, in Oleshnia, Stara Huta, and Bleshnia. 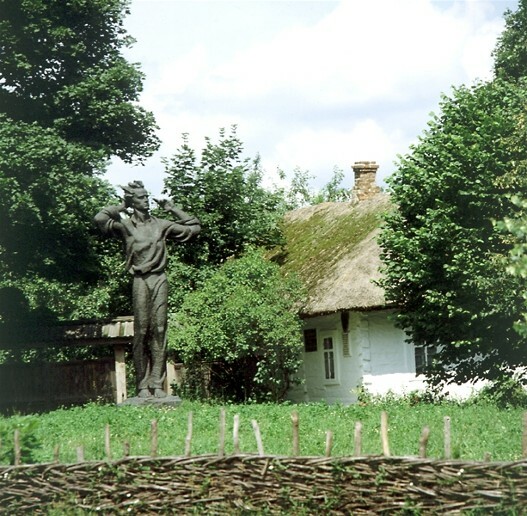 After the abolition of serfdom and the agrarian reforms in 1861, of the Chernihiv region's 3,805,000 desiatins of agricultural land, 1,889,000 desiatins belonged to the peasants, 1,625,000 desiatins were in private hands (of nobles and members of other estates), and 290,000 desiatins were held by the state and other owners (as of 1877). The reforms stimulated the expansion of industrial labor: 2,000 enterprises in the region employed about 30,000 workers. The principal branches of industry were sugar refining, with 12 plants (the largest being in Koriukivka), employing 30 percent of the gubernia's workers; liquor distilling (68 distilleries with 940 workers); textile manufacturing (for which Chernihiv was the most important region in Ukraine); match manufacturing, concentrated in Novozybkov; lumbering (12 sawmills); and hemp spinning (some small mills). Beginning at the end of the 1860s, zemstvos were introduced to manage the economic, social, and educational affairs of the gubernia. In 1869 a zemstvo collection, Chernigovskaia zemskaia nedelia, began to be published in Chernihiv, and in 1913 it was turned into a newspaper. Among the region's zemstvo activists there were many individuals with liberal, Ukrainophile attitudes: Oleksander Rusov, Illia Shrah, Fedir Umanets, Petro Ya. Doroshenko, Mykola Savytsky, Oleksander Tyshchynsky, I. Petrunkevych, and others. The zemstvos of the Chernihiv region played an important cultural and political role in supporting the work of such prominent figures as Mykhailo Kotsiubynsky and Borys Hrinchenko. Education improved in the second half of the 19th century, and 50,700 children (of a total of 210,000) were enrolled in the gubernia's 604 schools by 1897. At the end of the 1850s Sunday schools were founded at existing public schools and gymnasiums: in Hlukhiv, Chernihiv, Nizhyn, and Novhorod-Siverskyi. Day schools for girls were opened at county schools in Starodub, Horodnia, and Surazh. The Chernihiv Hromada (1861–3), founded by Oleksander Tyshchynsky, Leonid Hlibov, Stepan Nis, Oleksander Markovych, D. Lavrinenko, P. Borsuk, and others, published Chernigovskii listok, the only Ukrainian periodical in the entire Dnieper region. The journal was edited by Hlibov and had such contributors as Markovych, Oleksander Lazarevsky, and Oleksander Konysky. In the second half of the 19th century some natives of the Chernihiv region—the brothers I. and Volodymyr Debohorii-Mokriievych, Dmytro Lyzohub, and Mykola Kybalchych—belonged to the Russian populists (see Russian and Ukrainian Populism). The following Ukrainian writers lived and worked in the Chernihiv region: Hlibov, Marko Vovchok, Panas Myrny, Borys Hrinchenko (who in 1894–1902, while living in the region, published 50 Ukrainian books with a printing of 50,000), Mykhailo Kotsiubynsky, and Volodymyr Samiilenko. The Ukrainian historians Markovych, Oleksander Khanenko, Arkadii Verzylov, and Lazarevsky lived in the Chernihiv region and wrote many studies of the region, using its archival collections. Such well-known painters as Ilia Repin, Mykola Samokysh, K. and Vladimir Makovsky, Ivan Rashevsky, Mikhail Vrubel, and Lev Zhemchuzhnikov worked in the Chernihiv region. The famous actress and civic leader Mariia Zankovetska performed there. The noted bandura players Ostap Veresai, Terentii Parkhomenko, and Andrii Shut were born in the region. In 1893–1917 the Ukrainian Hromada, consisting of Illia Shrah, Arkadii Verzylov, Oleksander Tyshchynsky, Viktor Andriievsky, Volodymyr Samiilenko, Borys Hrinchenko, Mykhailo Kotsiubynsky, Oleksander Rusov and Sofiia Rusova, and others, was active in Chernihiv. In 1905 the Prosvita society was established there. The Chernihiv Committee of the Revolutionary Ukrainian party (RUP), in which Mykola Porsh and Mykhailo Rusov were active and which had peasants' and workers' organizations in Chernihiv, Oster, Kozelets, Shostka, Chemer, and other towns, was established in 1902. During the revolutionary period of 1905–6 (see Revolution of 1905) peasant strikes and unrest broke out in the Chernihiv region. The Chernihiv Committee of RUP issued proclamations to the workers and peasants, and the Chernihiv Ukrainian Hromada sent greetings to the Finnish diet, supporting the struggle for liberty. The Ukrainian Social Democratic Spilka in 1906 had local organizations in Nizhyn, Ichnia, Konotop, and Bakhmach. Shrah was elected deputy of Chernihiv gubernia to the First State Duma. At the beginning of the 20th century economic and social conditions in the Chernihiv region were difficult. The peasants, who accounted for 90 percent of the population, owned only 42 percent of the land. The other 58 percent of the land was in the hands of landowners with large or medium-sized holdings. In 1905 there were 267,300 small farms (about 73 percent of the farms) in the gubernia, and many peasants hired themselves out as farm laborers or migrated to distant regions in search of land. After the 1905–6 revolution the number of small factories increased, reaching 334 in 1913, with a work force of 28,000. About 80,000 tradesmen plied their trade in the cities and villages. Small landholders or landless peasants emigrated to Siberia. By the eve of the First World War the state of education had improved somewhat: 142,300 children, including 38,400 girls, attended the 1,746 schools in the gubernia in 1912. Yet 40 percent of the children received no schooling. With the outbreak of the Revolution of 1917 the Chernihiv region became involved in Ukraine's political and national life. At the Ukrainian National Congress Illia Shrah, H. Odynets, and M. Rubisov were elected deputies of Chernihiv gubernia to the Central Rada. During the Bolshevik invasion of Ukraine the Chernihiv region became one of the first battlegrounds: on 29 January 1918 a decisive battle between Ukrainian and Soviet troops took place at Kruty (see Battle of Kruty) on the Bakhmach–Kyiv railway line. Some Bolshevik activists, such as Yurii Kotsiubynsky, Volodymyr Antonov-Ovsiienko, M. Podvoisky, and V. Prymakov, were natives of the Chernihiv region. Under the Soviet occupation the distinctive features of the different regions of Ukraine began to disappear. Yet, in the 1920s a commission for Left-Bank Ukraine, chaired by Yosyf Hermaize, was formed within the historical section of the All-Ukrainian Academy of Sciences (VUAN) to study the Chernihiv and other regions. The commission published a number of works dealing with northern Left-Bank Ukraine. 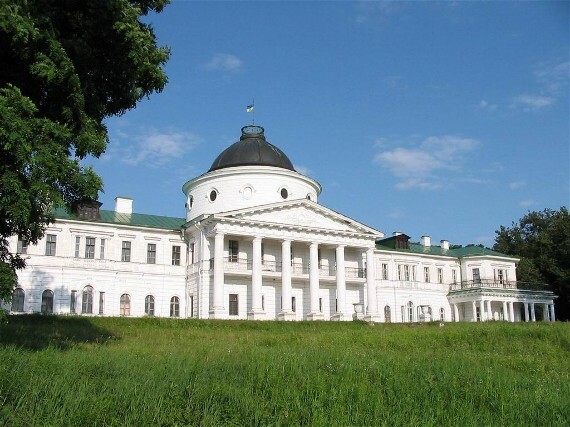 The VUAN maintained the Chernihiv Historical Archive under the direction of Pavlo Fedorenko. Among the prominent figures of this period the following were from the Chernihiv region: the writers Pavlo Tychyna, Stepan Vasylchenko, Vasyl Blakytny, and Ivan Kocherha; the film director Oleksander Dovzhenko; the composer and conductor Hryhorii Verovka; the musician Lev Revutsky; the economist and statistician Mykhailo Ptukha; and the historian Oleksander Ohloblyn. Church. 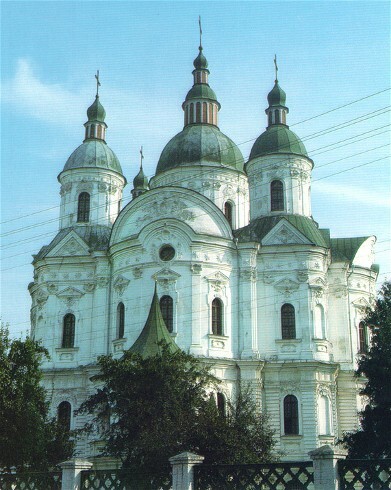 The Chernihiv eparchy with Chernihiv as its see was established at the end of the 10th century after the Christianization of Ukraine. 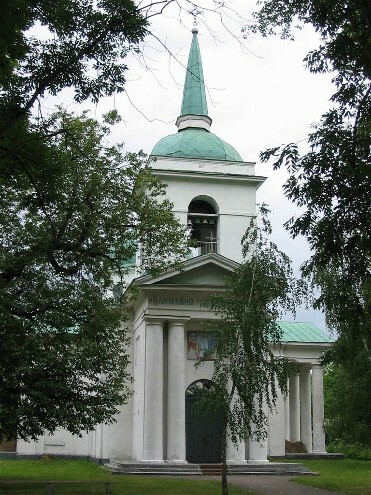 During the Lithuanian-Polish period the eparchy declined and for a time was part of other eparchies, such as the Smolensk eparchy. 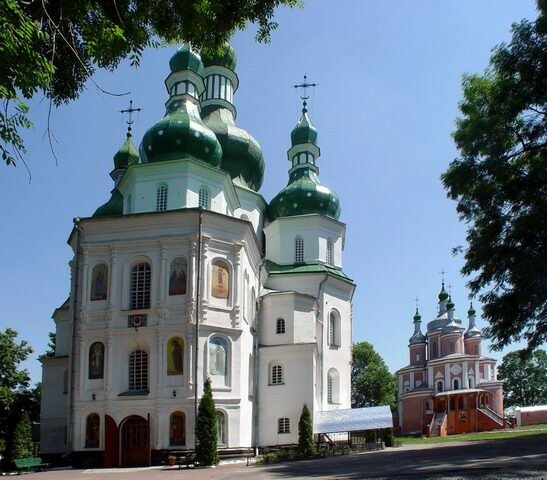 The eparchy was renewed in 1622 under the leadership of Bishop Isaia Kopynsky and then of Bishop Z. Prokopovych, and flourished under the care of Bishop Lazar Baranovych, who in 1667 was appointed archbishop of Chernihiv and Novhorod-Siverskyi. In 1688 the Chernihiv eparchy was removed from the control of the Kyiv metropoly and subordinated directly to the Moscow patriarch. Saint Teodosii Uhlytsky (1692–6) and Ioan Maksymovych (1697–1712) were noted Chernihiv hierarchs. 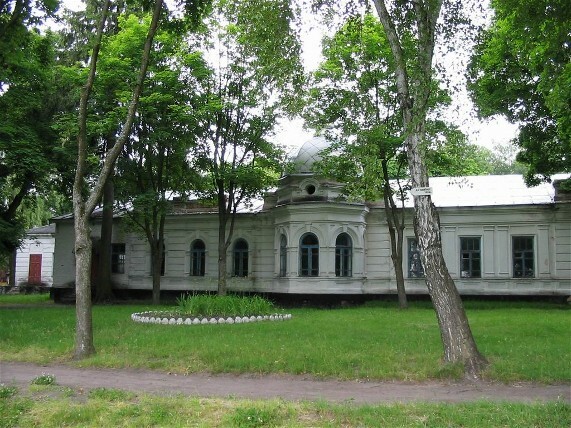 Chernihiv College was eventually turned into a theological seminary. In 1861 Archbishop Filaret Gumilevsky began to publish the semimonthly Chernigovskie eparkhial’nye vedomosti. During the existence of the Ukrainian Autocephalous Orthodox church Yurii Mikhnovsky (1921–2), Ivan Pavlovsky (1922–6), and O. Chervinsky (1927–30) served as bishops of Chernihiv. 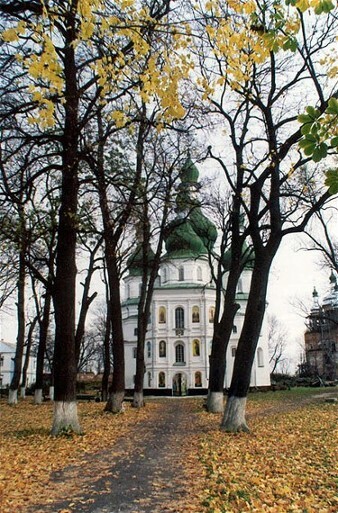 After 1945 the Chernihiv eparchy of the Russian Orthodox church was revived. A referral to this page is found in 83 entries.